It’s that time of year in Adelaide where everything happens at once and we’re left reeling with far too many choices. 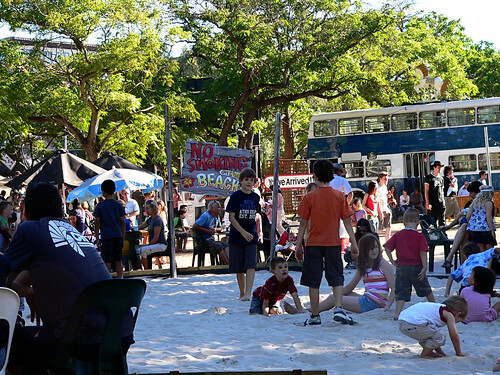 For the last few years the Adelaide Fringe and Womadelaide have been happening every year. It used to be that they were on alternate years so one year you could do the Fringe and the other year you could do Womad with no clashes in sight. But clash they do now and live with it we must. 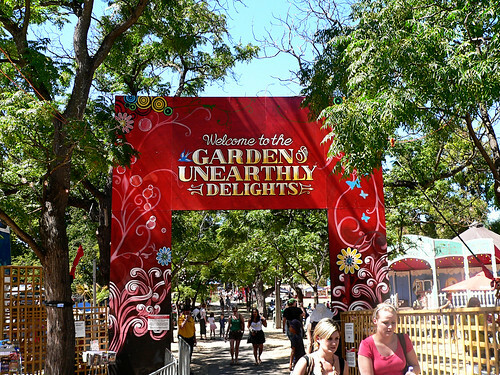 Therefore last weekend as our previous plans were suddenly changed we decided to venture into the city to the Garden of Unearthly Delights. JJ dragged me straight off to the small sideshow section and I thought we may as well get this over and done with so I said that he had a choice between the dodgem cars and the ferris wheel. 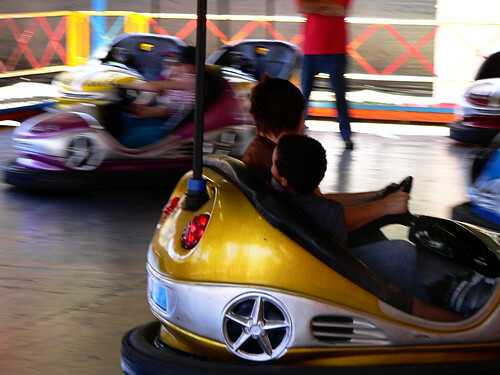 He chose the dodgem cars and I had a hard time not letting him take over the steering wheel and create havoc on the floor. My friend took photos and there’s one of me where I’m obviously telling him off for making us create a pileup. I didn’t include that one online anywhere. 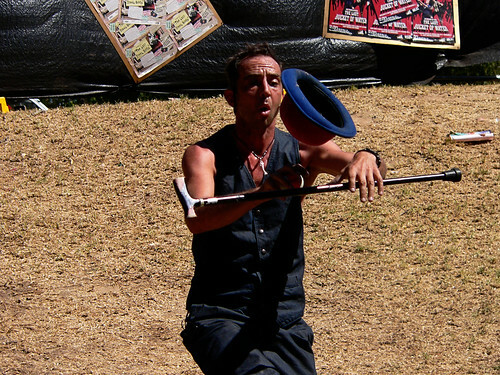 There is a busker section where the busker will do a show for about half an hour. They can always be guaranteed to say to the audience, come in – there’s plenty of room, and this is how we make a living – give me all your money. This guy, Jack was fairly entertaining and we chucked in a few bucks at the end. It was worth it not to hear JJ whinging for half an hour. Despite there being lots of kids entertainment at the Garden, JJ was bored and when he gets bored he gets hungry. 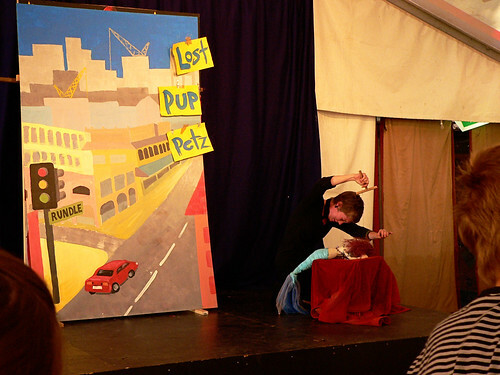 We sat down to have a gelati and then had another wander around and ended up at a puppet show – Puppets Break-Out. Near the puppet theatre was a bar and a big sandpit so after the show we sat down near the sandpit and sent JJ off to play. I should have done this earlier as he had a great time and he found a mate also playing and they kept each other occupied for the rest of the time we were there. I don’t know if the sandpit was meant for kids but it’s a godsend. Thank you organisers! And for the price of a beer $8 babysitting should have been thrown in for free. That beer went down too quickly but I didn’t go and get another one. 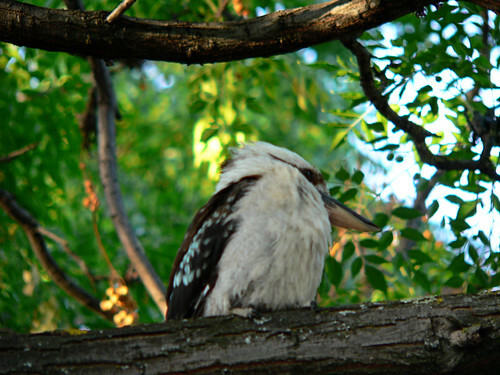 While I was sitting down enjoying my whinge free hour or so I heard a kookaburra laugh. A kookaburra had flown to a tree just near us and started laughing. I grabbed the camera and took a few photos. Kookaburras aren’t always found in the city and I wouldn’t have thought they would venture into a park packed full of people. I’d love to know what he was thinking. By about this time I’d spent nearly all my money and the evening was wearing on so we left. I’m sure we’ll head back to the garden again before the next few weeks is out. Oh wow – sounds and looks very cool!! Are you doing Womadelaide this weekend? You Adelodians get all the fun.